When her husband's job requires that they relocate to a small village in Dorset, Anna becomes absorbed in researching local history for her second novel. Quaint little Abbots Newton turns out to have been home to a notorious murderess. In fact, the murderess lived in Anna's house. In fact there's no use borrowing trouble, is there? Not when trouble keeps turning up on Anna's doorstep, and her new research project is looking more and more like obsession. 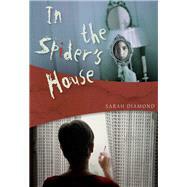 Sarah Diamond was a British writer of psychological suspense; she is the author of 4 novels, of which Spider's House was the last.